Local observers note that Poroshenko looks set to receive the support of the West, and that increases his chances of winning the election, even if some tampering with the vote takes place. In Ukraine, the electoral campaign preceding the presidential elections scheduled for March 31, 2019, officially kicked off on December 31, 2018. Meanwhile, the martial law imposed on 10 of the country’s regions (with more than half of Ukraine’s population living in them) was lifted days before the campaign started – on December 26. The martial law, which continued for one month, granted Ukraine’s unpopular president Petro Poroshenko dictatorial powers. He could shut down any media outlets, cancel and postpone any elections, arrest any people suspected of “collaboration” with Russia for an indefinite period of time. Protest rallies and political activities, such as party conventions and parliamentary investigations, were also put on hold. The question is: can the elections, due to be held 3 months after the ending of the martial law, be considered free and fair? And can president Poroshenko be tempted to impose the martial law again before the elections? In any democratic country, Poroshenko would have rather slim chances with his low voter approval rating at 11.6 percent (the data from the latest poll conducted by the Kiev-based International Sociology Institute). The strongest candidate, the former prime minister Yulia Tymoshenko is 10 points ahead of him with 21.6 percent. Poroshenko imposed the martial law on November 26 because of the arrest of three Ukrainian military vessels near the Kerch straits in the Black Sea, where both Ukraine and Russia have big ports and military bases. The Russian side claimed that the Ukrainian vessels illegally entered the Russian territorial waters before trying (unsuccessfully) to enter the Kerch Strait – a narrow water pass connecting the Black Sea with the Azov Sea. That sea is a shallow water reservoir, most of it unfit even for medium-sized military ships. Just a few years ago no one could imagine the Azov Sea being unimportant strategically, since Russia controlled Azov since the 17th century and almost all the population living on its shores was Russian-speaking. The biggest Ukrainian port on the Azov Sea, Mariupol, with its Russian population, was part of the anti-Maidan rebellion in the Russian-speaking east of Ukraine in 2014. The city also took part in the unrecognized referendum on federalization of Ukraine that same year, but in a few weeks, in May 2014, Mariupol was seized by the Ukrainian army, which was already advancing against the rebellion on Donetsk and Lugansk, using tanks, aviation and artillery. Now the Azov Sea suddenly became hugely important in the eyes of both the EU and the US. After the two Ukrainian small navy ships and a tug boat (with 24 people on board) were arrested by Russians for entering the waters which even before Crimea’s reunification with Russia were considered Russian waters, both the US and the EU suddenly started taking the problems of the Kerch Strait close to heart. President Trump cancelled his scheduled meeting with president Putin in Argentina in the end of 2018, saying the two leaders would meet when the Ukrainian seamen and ships are returned to Ukraine. France’s and Germany’s leaders Emmanuel Macron and Angela Merkel on the eve of the New Year suddenly developed a strong desire “to see the Ukrainian seamen celebrating the holidays with their families,” making a special strong-worded statement against Russia on the subject. The hypocrisy of the American and European leaders with their numerous “concerns about the state of democracy” became especially evident, when no one in the US and the EU protested against Poroshenko’s decision to impose the martial law after the incident near Kerch Strait, which was no match to the tragic peak of the civil war in 2014-2015. According to Ukrainian opinion polls, no less than 60 percent of Ukrainians did not approve of Poroshenko’s decision, seeing in it only an attempt to stay in power, having nothing to do with defense of the country. On December 28 Poroshenko convened a special closed meeting of the country’s top generals and security officials to discuss the outcome of the martial law. Poroshenko said he actually would have preferred to keep the martial law, but the requirement to have a three months long electoral campaign made this variant impossible. However, Poroshenko’s chances of winning increased – even without an increase in his ratings, he saw his enemies demoralized. Despite the fact that Yulia Tymoshenko warned about Poroshenko’s plans to cancel the elections by an imposition of the martial law as early as in July this year, her faction did not put up much of a resistance to Poroshenko’s idea (the vote in the Rada was 270 against 60 in favor of the martial law). Tymoshenko’s faction avoided a fight. And a fighter which does not fight – this fighter has lost already. Local observers note that Poroshenko looks set to receive the support of the West, and that increases his chances of winning the election, even if some tampering with the vote takes place. As for a new “series” of martial law, there are lots of enthusiasts for this kind of solution in Ukraine. For example, a Rada deputy named Vitaly Kupryi registered in the Ukrainian parliament a draft law, which requires the president to declare Ukraine “in the state of war with Russian Federation,” cutting all transit of Russian oil and gas through Ukraine (an idea not likely to receive support from the EU). So, the likeliest outcome will be a state of tension, “neither peace nor war,” which would allow people not to see a dramatic worsening of their situation while allowing Poroshenko to stay in power. Crimea is Ukraine, occupied by a Nazzi-Junta in Moscow does not change that. Ukronazi moron! Idiots like you have brought the Ukraine to its present state of a failed, bankrupt hell-hole, that will never recover. All by yourselves: you are the most stupid people in Europe, if not the whole world. Ok if you think Crimea is Ukraine, go try to take it back. Ukraine is Russia; the sooner it will join the motherland again, the better. Spoken like a Nazzi. 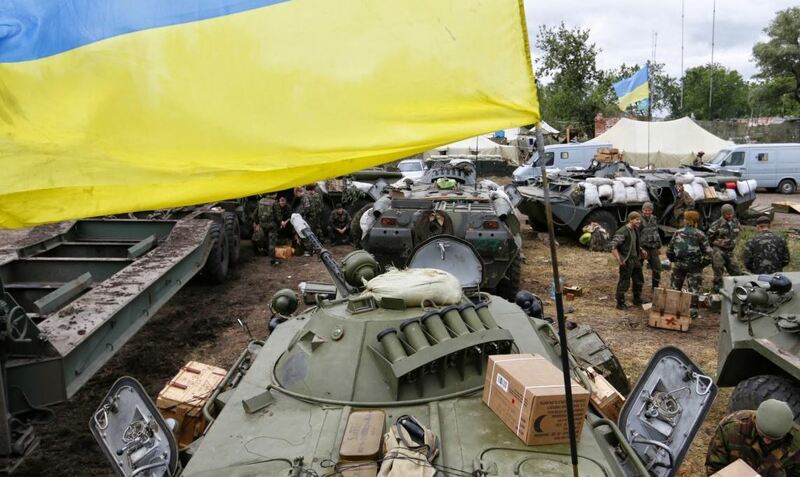 Russian troops invaded Ukraine, started the Holy war! He always shows up here when Ukraine is discussed. He must be some sort of Ukrainian agent/troll. Troll, yes. Agent, no. Even Kiev has standards for their propaganda. Veth is little more than a useful idiot and antagonist. He has no teeth and his bark is getting more distant every day. Lying thieving corrupt murderous Kiev and its sicko ZioWestern backers are a joint basket case.